The POWER-3™ is a high performance 3-stage HVLP turbine paint spray system. Using Tappered Fan Technology (TFT™) the turbo motor produces 7.0 PSI of sealed air pressure. The POWER™ series systems have Quadra-Clean™ air filtering process using 2 layers of filters for both motor cooling and the air to your spray gun. 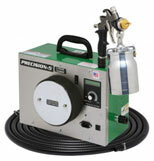 The POWER-3™ is a high performance 3-stage HVLP turbine paint spray system. Using Tappered Fan Technology (TFT™) the turbo motor produces 7.0 PSI of sealed air pressure. The POWER™ series systems have Quadra-Clean™ air filtering process using 2 layers of filters for both motor cooling and the air to your spray gun. The POWER™ series case is made in powder coated steel with 26 cooling louvers to increase motor longevity and contains the exclusive Handi-Hold™ spray gun docking station to hold and transport your spray gun without fear of it falling over. This system is great to spray a wide variety of thin to medium viscosity finishes with little thinning needed on cars, boats, planes, wood projects, fencing and more. Made in the USA the POWER-3™ is backed by a full 2-year warranty with a 1-year bonus for registering on the companies website within 30 days of purchase. With over 50 years of manufacturing experience and a 3 year warranty you’re in great hands with ApolloSpray® HVLP. 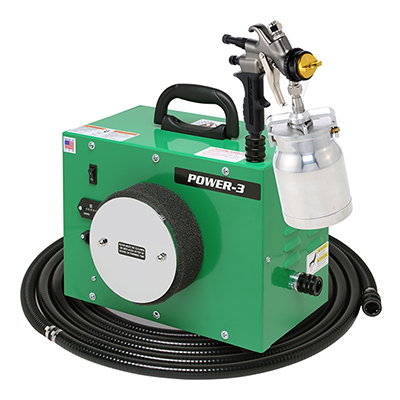 The POWER-3™ is supplied with a 24′ foot Air-Flex™ air hose that includes a flexible whip end to help with operator fatigue and the AtomiZer A7700QT non-bleed style spray gun, with stainless steel wetted parts, Expansive fan control ring and a quart size bottom cup. Tappered Fan Technology (TFT™) = higher turbine pressure. Quadra-Clean Air Filters = Cooler motor temperatures for longer motor life. Sturdy steel case with 26 cooling louvers = cooler motor, longer life, industrial quality. Hour Meter = better maintenance. Lightweight Alloy Quick Connect = Faster and easier to connect air hose. Handi-Hold™ Spray Gun Docking Station = Store your spray gun without fear of it falling over. AtomiZer spray gun = The One Gun That Does It All…™. Air-Flex air hose = lightweight.